 Public Lab: Have you used the particle atlas? Question: Have you used the particle atlas? It was put out by mccrone labs(a well respected microscopy lab). The first edition we used was two volumes. The next edition was four volumes. Don't know how many volumes it runs now. It covers microscopes and sample prep as well as providing a set of pictures for comparison. Mccrone used to offer a week long course in microscopy. Well recommended for particle analysis. My boss took the course but never could get them to send me. This is fantastic - do you have a copy or could we find a copy and share pictures especially of silica particles? I do have a copy of edition two, which is four volumes. Volume 1 goes over microscopes, volume 2 gives pictures of the different materials, and volumes 3 and 4 seem to talk about SEM and TEM. As for silica, there are a number of pictures. 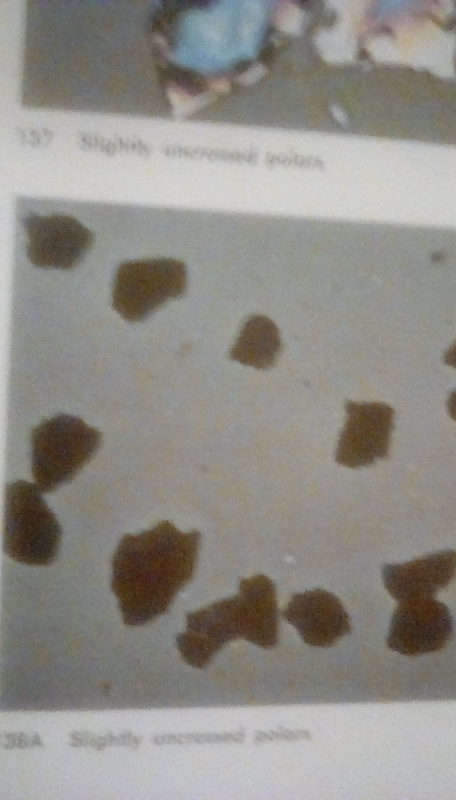 The book points out, on page 304, that there are many forms of silica. It lists quartz , sand, ground quartz, amethyst, opal, flint, vitreous silica, and diatomaceous earth as different forms. I didn't check all of those forms, but a number of those are shown in the book. We've been trying to use DIY microscopes to distinguish between crystalline and non-crystalline particulate matter. Of course we wouldn't be able to identify the composition of the PM with a microscope. However, we're thinking that being able to identify jagged primary particles from other PM near industrial frac sand mines could demonstrate the likelihood of respirable crystalline silica there. 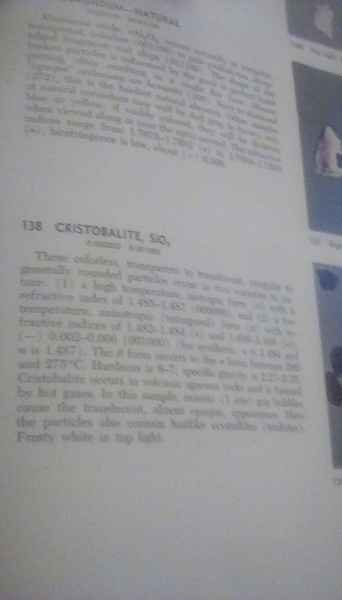 Do you think there are images in the book that would held distinguish crystalline silica (namely quartz, but also cristobalite and tridymite) from other crustal PM that might be found in a rural farming area? I'm no expert on microscopy. Did mess with it a little. The difference I notice is a lot of the work is done with crossed polars- messing with the polarized light filters. They also do some determinations of refractive index. I applaud the work you are doing on microscopes. They can be quite expensive. Please keep up the good work. You might look up the particle atlas in a college library. If it looks worthwhile, let me know. They are gathering dust here. I would donate them. I checked the images. 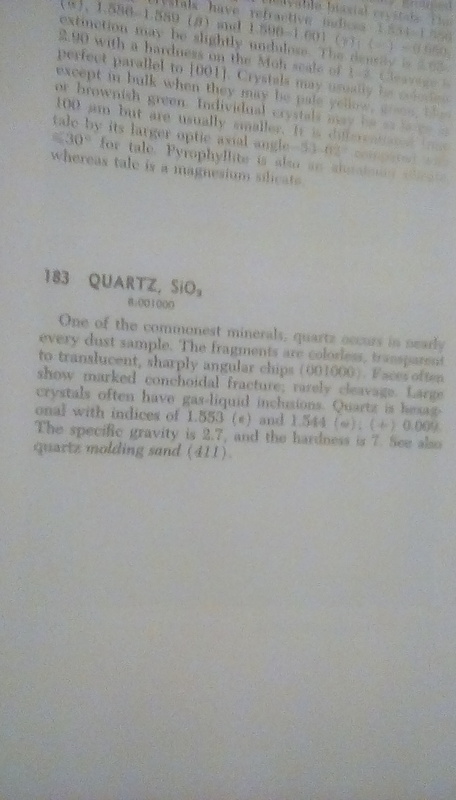 There are pictures of quartz and several for cristobalite. Didn't see one for tridymite. I'm glad you brought this up, @Ag8n! @Mathew did some work with polarimetry too. 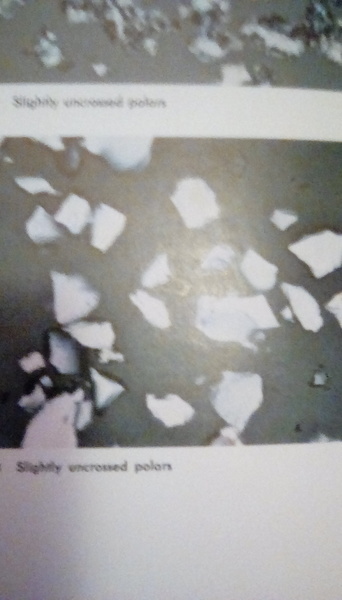 See this research note: https://publiclab.org/notes/mathew/05-21-2014/imagining-testing-polarized-light-microscopy-for-silica-dust-speciation. I wonder if we could first identify jagged particles in the >5um size range, and then, if we do see jagged particles, do a quick polarimetry setup like Mathew did to see if they refract light. Great idea. There could be stages of analysis, narrowing in progressively. +1! These are photos taken from" the particle atlas", second edition, volume II, by mccrone. Thank you so much, @Ag8n! This is exactly what I was hoping to see. I live near Duke University and can see if they have the books there too. Does it happen to say in either of those images what the magnification is? Also, its interesting that cristobalite is rounded. 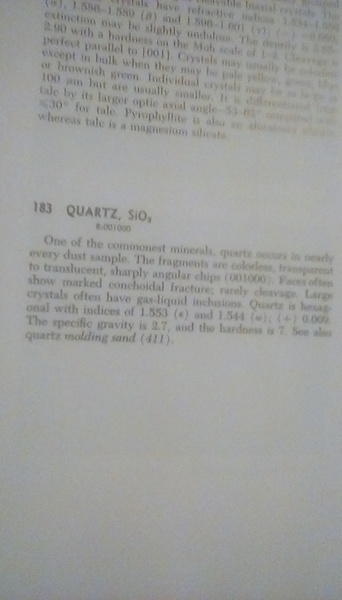 I will look in the literature to see if there is a relationship between cristobalite and silicosis, or if it is really just quartz. It gives a range of magnifications. As for sample prep- "samples were mounted in aroclor 5442 or the equivalent Carville refractive index liquid 1.660" . It gives more lengthy details on specific substances like pollens, etc.